There are lots of mood enhancers on the market, and there are also various skin- and hair-coloring agents, blood pressure reducers, and a few treatments for controlling the symptoms of Parkinson’s Disease. Many of them work well for some people and poorly for everyone else. It would be nice to have alternatives. And we do have alternatives! One of them is Acetyl Tyrosine. thyroid hormones that help to regulate blood pressure. N-acetyl-L-tyrosine, which is converted in the body to L-tyrosine, is 20 times as soluble in water as tyrosine itself. For this reason, it serves as an efficient supplement for raising tyrosine levels in the body, since undissolved substances are not absorbed from the digestive tract. 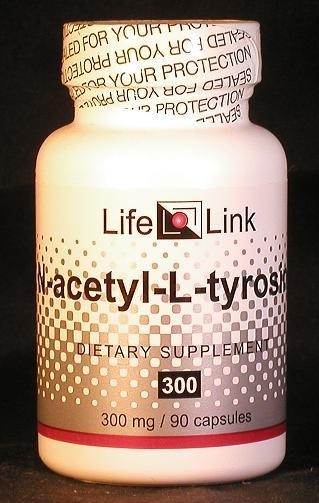 LifeLink’s Acetyl Tyrosine also contains vitamin B-6 — a required cofactor for neurotransmitter synthesis. N-acetyl-L-tyrosine, which is converted in the body to L-tyrosine, is 20 times as soluble in water as L-tyrosine itself. For this reason, it serves as an efficient supplement for raising tyrosine levels in the body, since undissolved substances are not absorbed from the digestive tract. Our product also contains vitamin B-6 — a required cofactor for neurotransmitter synthesis. Accordingly, we will limit our discussion of acetyl-L-tyrosine to a brief summary of recent tyrosine research, and let you draw your own conclusions about what medical conditions it may be effective in treating. Most of the medical research relating to tyrosine supplementation has been conducted using L-tyrosine itself, not acetyl-L-tyrosine. It is logical to assume, however, that the conclusions reached will apply to acetyl-L-tyrosine as well, since the latter is converted to L-tyrosine in the body. The following discussion therefore draws from studies of L-tyrosine. Although, in theory, tyrosine supplementation should promote melanin production in human skin, no clinical studies have been performed to test this concept directly.11 On the other hand, the closely related amino acid L-phenylalanine has been shown to restore skin pigment in cases of vitiligo — a localized loss of skin pigment.12 In the body phenylalanine is converted to L-tyrosine, which suggests that L-tyrosine supplementation would have produced similar results. 3 mg of beta-carotene, 3 mg of lycopene, 5 mg of vitamin E and 30 mg of vitamin C.
Acetyl-L-tyrosine is sometimes used by Parkinson’s patients to boost concentrations of the neurotransmitter dopamine in the brain, while avoiding the side effects of taking such dopamine precursors as L-dopa. A small clinical trial in the 1980s compared the use of L-tyrosine to L-dopa, and the researchers concluded that “For some patients, 3 years of L-tyrosine treatment was followed by better clinical results and many fewer side effects than with L-dopa or dopamine agonists.”16 This approach has not been followed up with further clinical studies. Are acetyl-L-tyrosine supplements useful for the conditions and purposes mentioned above? We aren’t allowed to tell you, so you should take a look at some of the references cited here, and then decide for yourself. Tyrosine improves cognitive performance and reduces blood pressure in cadets after one week of a combat training course. Brain Res Bull. 1999 Jan 15;48(2):203-9 Deijen JB, Wientjes CJ, Vullinghs HF, Cloin PA, Langefeld JJ.